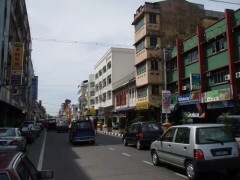 Kota Bharu is Kelantan’s state capital and it can be found on the Eastern coast of the Malaysian peninsula. A lot of people travel to this area when they’re trying to reach the Perhentian Islands, but it’s worth visiting even without having to go through it. There are a few museums to visit, there is very good food, there is a nice architecture to enjoy and all in all the city has its own cultural identity and it’s definitely worth visiting. The Kota Bharu area is quite conservative and the state is ruled by PAS (Malaysia Islamic Party). While you’re there you should be respectful of the religious and cultural feelings of the inhabitants of the area. While women don’t have to wear scarves, they do need to wear clothes which cover the torso fully. You should expect breaks in service to take place from time to time, as Muslims take part in Islamic prayers. If you’re in the Independence Square area you will find a number of museums there. Many of these museums, plus the Royal Palace which is located nearby, have their own style of architecture, quite elegant and definitely worth checking out. Pasar Besar is the one you should absolutely see though and it’s the central market of the city. The building is octagonal and there is a very active and colorful market taking place here daily. In the vicinity there is a square which becomes an evening food market called Pasar Malam. If you’re interested in the culture and history of Kelantan, your best shot at finding out more is visiting the Kelantan State Museum (Muzium Negeri Kelantan). Most of the museums open in the morning at 8:30 AM and close in the afternoon at 4:45 PM (all museums are closed on Friday). Among the museums which are available in the area you will find the Islam Museum, the Royal Museum, the World War 2 Memorial, the State Museum, the Handicrafts Museum and the Royal Kelantanese Traditions Museum. You also have the option of visiting a number of temples in the area, like the Wat Mai Suwan Khiri (a standing Buddha and dragon boat), the Wat Pothivihan (a very large reclining Buddha), Wat Machimarran Varran (the Buddha that sits), plus many other Buddhist temples. If you want some other ideas of things to do, you can go to the Cultural Centre for a show which takes place three times each week, you can take a river cruise from Sungai Galas to Dabong, you can go to the caves from Gua Ikan Dabong or you can visit the Stong Waterfall, which has a height of 990 metres.